France is very clear on the legalities of marriage. Any other type of ceremony , religious or non-religious is considered symbolic. Even a catholic ceremony in a church has no legal validity in France. The only condition for a symbolic ceremony ( especially a Church one) is that the civil ceremony is performed first. (I don’t think this applies any more). If you want a legal solemnizing by a humanist celebrant you must perform the ceremony in your own country. Most couples nowadays who are looking for a non-religious but meaningful ceremony opt to do the legal paperwork first quietly in the most convenient country with their witnesses. They then have a large “symbolic” ceremony surrounded by their family and friends in any country of their choice. 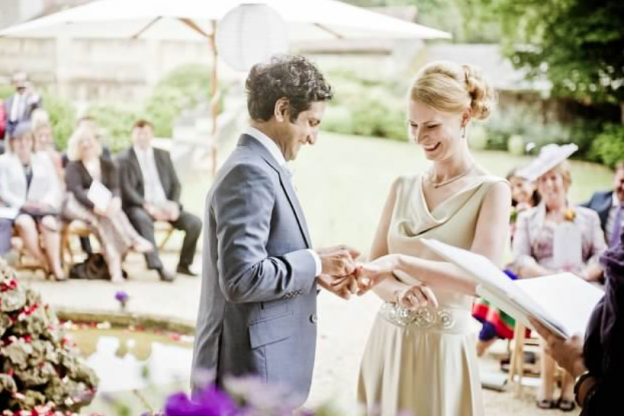 Although a non-religious, humanist blessing is not a legally recognized marriage ceremony, it is a perfect solution if you are unable to meet the residency and legal requirements in the country where you would like to celebrate your wedding. I do many French ceremonies immediately after the civil one at the Mairie. I hope I haven’t jangled your brains with all this info.